Curiosities of Central New York — will transport you into a land of history, legend and mystery located here in the heart of the Empire State. The people of Central New York know there’s something different — perhaps strange — in the air. Across this vast and often wild region, history and lore are remarkably and markedly unusual. Ancient Iroquois mystical traditions still infuse the landscape with a sense of the otherworldly, and for some, witchcraft was a constant fear throughout the nineteenth century. Monsters and even fairies roam the region, frightening or delighting those who say they have encountered them. Visit the world’s smallest church in Oneida and North America’s only Tibetan monastery, Namgyal, in Ithaca. Join local folklorist Melanie Zimmer as she explores the curiosities of Central New York. 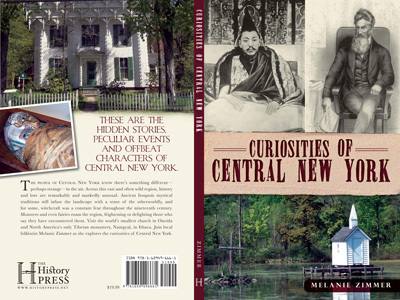 Curiosities of Central New York contains one hundred twenty-eight pages of important and little known tales from New York State and lots of photographs. It’s yours for $19.99. This book is in limited supply. Buy yours now! Please contact Melanie Zimmer for book signings or readings for Curiosities of Central New York.